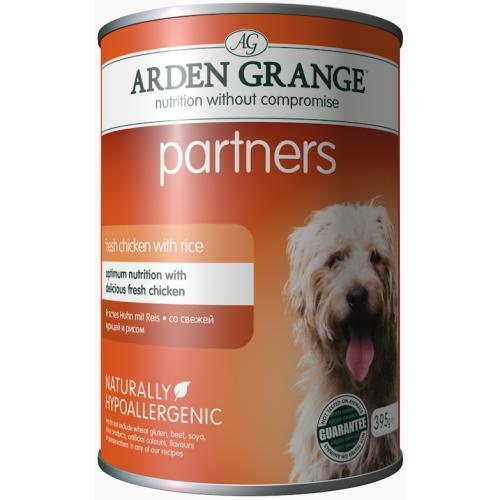 A tantalising recipe the Arden Grange Partners Chicken & Rice Dog Food is a delicious combination of nourishing goodness. Suitable for dogs from 9 months the wholesome and complete diet of vitamins and minerals which provides your dog with the foundations of health and wellbeing is a succulent way to keep them engaged at meal time. Formulated by leading experts the Arden Grange team use their passion and expertise to create recipes which full of goodness are tailored to support your dog’s development needs. Made in the UK you will find that the time and care intertwined in every recipe will gain your trust and faith so that as they years pass by you find Arden Grange the constant friend. Ingredients: Fresh chicken (70%), Rice, (5%), Minerals, Peas, Carrots, Beet pulp, Fish oil, Seaweed extract, Glucosamine, Chondroitin, Cranberry, Yucca extract, Yeast Extract (High nucleotides). Typical Analysis: Moisture 70%, Crude Protein 11%, Fat Content 8%, Crude Ash 3.5%, Crude Fibres 1%. Nutritional Analysis: Vitamin A 4,500 IU, Vitamin D3 656 IU, Vitamin E 52 IU Trace Elements, Zinc sulphate monohydrate 133 mg, Iron sulphate monohydrate 83 mg, Copper sulphate pentahydrate 19mg, Manganese sulphate 12.5 mg, Calcium iodate anhydrous 1.43 mg, Sodium selenite 0.18 mg.